• To improve performance and quality. • To provide assurance that minimally acceptable standards are achieved. • To provide accountability both for levels of performance and value for money. These three purposes are not necessarily compatible and consideration of the tensions between them is imperative in the development of regulatory programmes (Walshe 2003). For example, if improvement is the main objective, ambitious standards and targets are used to challenge the status quo and help organisations identify areas for development. If however, the main priority is to provide assurance, standards are set at a minimum acceptable level and there will be little discrimination between organisations as most should be able to comply easily. The third purpose, accountability, requires methods that allow regulators to differentiate and compare performance in an objective and meaningful way. The QQUIP review of the evidence relating to regulation and quality of care identifies three different types of regulatory strategies: Institutional regulation, professional regulation and market regulation. Examples of institutional regulation may include the setting of targets or standards or accrediation schemes. The WHO/UNICEF baby-friendly hospital initiative is an example of an accreditation (organisational-structural and regulatory intervention) system which has been implemented for many years globally. The scheme aims to increase maximize the health and cost benefits of breastfeeding through promoting breastfeeding and parent infant relationships within hospitals. It operates around a set of standards required for accreditation and performance information is published and compliance rewarded through an award system. The use of registration in medical and nursing councils for health professionals to retain their license to practice and to enrol for continuous professional development is a routine process in many countries and an example of a professional regulatory quality improvement process. Market regulation seeks to manage the advantages of competition and to prevent monopolies, to ensure accountability and to manage the supply of services. Specific interventions may include activities such as rate setting, mandatory reporting and public disclosure. There is limited, and predominantly observational evidence, evidence regarding the link between regulation and quality improvement, particularly in LMIC countries. The links between regulation and improvements in quality are primarily associative rather than causal (Sutherland and Leatherman 2006). Often, combinations of quality improvement strategies are put together to become multifaceted. These may include interventions from across the four categories outlined in the EPOC framework (professional, financial, regulatory and organsiational) and/or be oriented towards different stakeholders. Evidenced examples include: the development of multifaceted outreach services to improved the quality of care, and patient satisfaction; in the treatment of diabetes within rural communities who are at risk of receiving sub-optimal care due to location (Majumdar et al 2003); Facility based interventions using five dimensions of care (patient history, clinical examination, laboratory examination, delivery care and postpartum monitoring) having an impact on maternal health in Senegal and Mali (Pirkle et al 2013); and community and facility based interventions to improve MNH (Lassi et al 2014). Other approaches include using education and training alongside organisational interventions, for example in the treatment of depression and hypertension in primary health care facilities. 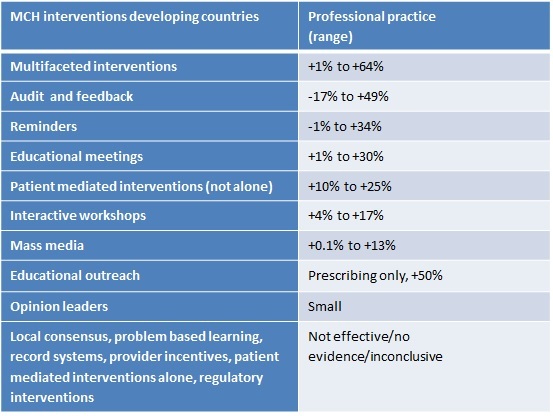 Figure 3.6 below shows that interactive workshops, reminders, mass-media and patient-mediated interventions improve professional practice with moderate effects. Variable effects are seen in educational outreach and audit and feedback interventions (Althabe et al 2008). According to the data the effectiveness of quality improvement strategies is optimised if they are multifaceted, i.e. those that combine several quality improvement approaches. It is not known whether these are more effective than single interventions. Other reviews have found no compelling evidence for increased effectiveness of multifaceted approaches in changing specific areas of quality (Squires et al 2014). Question for reflection: Which quality improvement strategies would make a difference where you work? Are there others that you think could make a difference and are not discussed? Focusing on one of those strategies, consider how you would take it forward and ensure it was implemented. Then reflect on the main challenges to get the required investment, institutional buy-in and practical skills and capabilities. Does the approach look feasible in the short-term at scale? Walshe, K. , (2003) Regulating healthcare: a prescription for improvement?